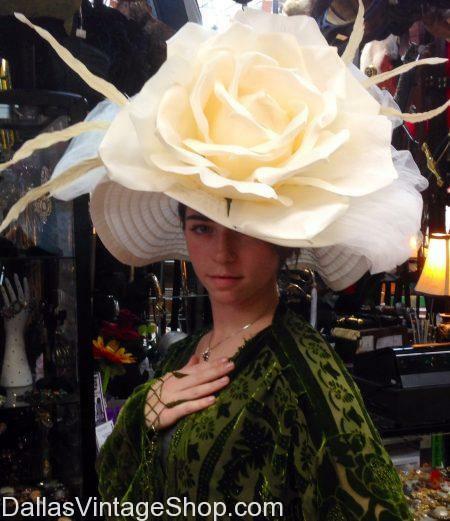 Spring Fashions Derby Hats Have Arrived at Dallas Vintage Shop. Posted in Derby Dame Hats | Comments Off on Spring Fashions Derby Hats Have Arrived at Dallas Vintage Shop. We give you all you need to know about the Kentucky Day Activities, Race Times, Kentuchy Derby Dame Hat Contest Rules, Lone Star Park Directions & Official Website Links and we bring you elegantly designed Kentucky Derby hats for all of the Dallas area Kentucky Derby celebrations. We have an immense variety of prize winning Derby Dame hats. Expect to find more Hats than you have ever seen in one place. Dallas Vintage Shop has the largest & most diverse selection of Derby Hats for Ladies or Complete Derby Outfits for Derby Dames. We have Gentleman’s Derby Hats or Complete Outfits for Derby Gents too. It’s all right here in our shop. You are in Derby Dame Hats category.